Cataracts are one of the most common conditions that affect vision in people aged 40 and above. In fact, over 90 percent of the people above the age of 65 have cataract. Cataract is a condition in which the natural lens of the eye gets clouded. 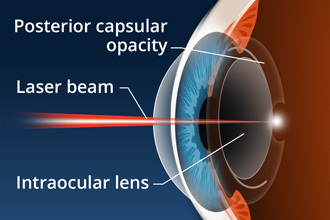 When this change becomes significant to patient daily activities, laser cataract surgery can be performed. Cataract surgery involves the removal of the natural lens and the implantation of intraocular lens implants. The lens is implanted within the lens membrane of the eye, and in some patients, the lens membrane starts to thicken after cataract surgery. The lens membrane thickens and also becomes cloudy, thus affecting vision. Capsule thickening, in most cases, takes place months or even years after the laser cataract surgery. In such a situation, a technique called YAG laser capsulotomy is used to treat the condition. As the capsule thickens and becomes cloudy, it prevents light from reaching the back of the eye causing the patient to get a glare when there is bright light. In YAG laser capsulotomy, a special lens is used to concentrate the YAG laser in order to create a hole in the center of the lens capsule. Light can then pass through this small hole. The eye is first numbed and the pupil is dilated using opthalmic drops. YAG laser capsulotomy is a fairly simple procedure and is often labeled as a walk-in walk-out procedure. The patient is then seated behind a machine with the YAG laser attached to it. In order to view the lens membrane clearly, the doctor will put a mirrored lens on the eye. The lens is then used to precisely direct the laser beam to the center of the lens capsule and a small hole is made. The procedure takes a few minutes, and is completely painless. After the procedure, the patient is sent home within an hour barring any complications. Immediately after the procedure, vision is blurred for sometime, usually until the dilating drops wear off. Bright lights can cause discomfort. These side effects will subside gradually. The doctor may prescribe anti- inflammatory drops as part of the post-operative care routine. Patients can return to their normal routine wihtin a few hours after the treatment. Some patients experience new floaters, dots or webs in their vision, but these tend to suside pretty quickly. The patient is left with the clear vision that their laser cataract surgery provided them initially.